I’ve tried and tested several different finance or expense tracking apps on iOS. We’ve written about several good ones here on Beautiful Pixels and continue to come across some amazingly beautiful ones every few weeks. Spendee is the latest expense tracker for iPhone that landed in our inboxes last week and it has been quite fantastically making me log my expenses using it’s scrumptious UI. Spendee’s UI is quite possibly one of the most delicious set of pixels to make its way onto my iPhone ever since Apple demoed iOS 7 at WWDC. The design of the app’s UI seems to be heavily inspired by the new iOS 7 announcement, or at least what it was rumored it would be like. Spendee is mostly “flat”, uses playful colors and looks splendid. The glyphs & typography used in the app is gorgeous and overall Spendee has a very classy, very modern feel to it. Spendee is just as functionally solid as it is good looking. Logging your expenses in the app is a breeze — just enter the amount, pick a category the expense belongs too, optionally change the date, add a note and photo and you’re set. 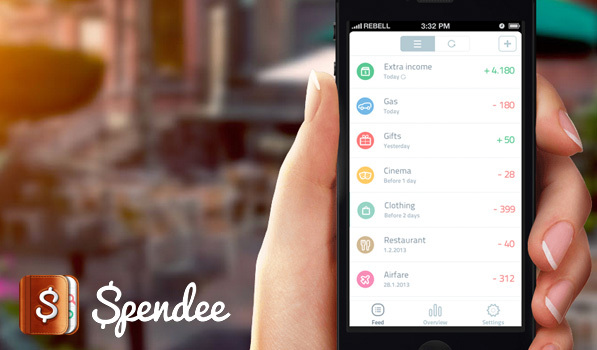 You can add single or repeating expenses as well as earnings in Spendee. Your feed tab shows you all the latest expenses or earnings you’ve logged in the app. There’s also an Overview tab that, well, gives you a beautiful overview of where your money ends up being spent. The settings lets you set a password in the app or a reminder so you never forget to log your expenses. There are some very tasty animations in the app, which look great. Not just that, but the developers have created an incredible website for the app that takes you through a great walkthrough as you scroll through it. It definitely scores high points as a #scrollbabyscroll site. Spendee is now available on the App Store and is Free for the next 3 days. My only real complaint is the app’s icon. For an app with such a beautiful “flat” design, I’m not sure why the designers chose to go all “skeuomorphic” on the icon.